The New Testament gives very specific details and revelation from God on the afterlife. Did Old Testament believers have any such notions? There are some indications, though not so many. 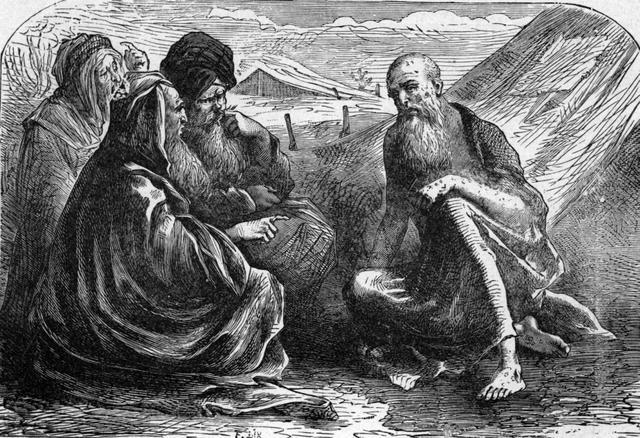 The book of Job is considered to be one of the oldest books in the Bible. Therefore from the earliest times on record we know that there was some knowledge of the afterlife. Job 19:25-27 For I know that my Redeemer lives, and that He shall stand at the latter day upon the earth: 26 And though after my skin worms destroy this body, yet in my flesh shall I see God: 27 Whom I shall see for myself, and mine eyes shall behold, and not another; though my reins [heart] be consumed within me. Job had the assurance that although he was going to die and be eaten by worms, he would receive a new body (“in my flesh”) and in that body he would see God face to face, i.e. in his conscious mind. Isaiah 26:19: Your dead men shall live, together with my dead body shall they arise. Awake and sing, you that dwell in dust: for your dew is as the dew of herbs, and the earth shall cast out the dead. Daniel 12:1-3, And at that time shall Michael stand up, the great prince which stands for the children of your people: and there shall be a time of trouble, such as never was since there was a nation even to that same time: and at that time your people shall be delivered, every one that shall be found written in the book. 2 And many of them that sleep in the dust of the earth shall awake, some to everlasting life, and some to shame and everlasting contempt. 3 And they that be wise shall shine as the brightness of the firmament [night sky]; and they that turn many to righteousness as the stars for ever and ever. These two OT passages describe at least the resurrection of many. In regards to Daniel 12:2 I have for a long time believed that it refers to the saved who are resurrected, some obtained rewards because of their faithfulness and others were shamed because of their unfaithfulness. Nevertheless these verses (Isaiah 26:19, Daniel 12:2) were fulfilled at Jesus resurrection. The saved believers (the Old Testament saints) came out of the graves when they were resurrected after Christ’s resurrection. How many is many? We don’t know but it was not all men. Psalm 49:6-20 They that trust in their wealth, and boast themselves in the multitude of their riches; 7 None of them can by any means redeem his brother, nor give to God a ransom for him: 8 (For the redemption of their soul is precious, and it ceases for ever: [the payments go on forever]) 9 That he should still live for ever, and not see corruption. 10 For he sees that wise men die, likewise the fool and the brutish person perish, and leave their wealth to others. 11 Their inward thought is, that their houses shall continue for ever, and their dwelling places to all generations; they call their lands after their own names. 12 Nevertheless man being in honour abides not: he is like the beasts that perish. 13 This their way is their folly: yet their posterity approve their sayings. Selah. 14 Like sheep they are laid in the grave; death shall feed on them; and the upright shall have dominion over them in the morning; and their beauty shall consume in the grave from their dwelling. 15 But God will redeem my soul from the power of the grave: for He shall receive (לָקַח laqach (law-kakh’), to take) me. Selah. 16 Be not you afraid when one is made rich, when the glory of his house is increased; 17 For when he dies he shall carry nothing away: his glory shall not descend after him. 18 Though while he lived he blessed his soul: and men will praise thee, when you do well to yourself. 19 He shall go to the generation of his fathers; they shall never see light. 20 Man that is in honour, and understands not, is like the beasts that perish. Here is illustrated a stark contrast between the end of the lives of the wicked and the end of the lives of the righteous. The wicked are like “the beasts that perish” (Psalm 49:12,20) without any hope that they “should still live for ever” (Psalm 49:9). However, the righteous have the triumphant expectation that “… God will redeem my soul from the power of the grave (שְׁאוֹל sh’owl (sheh-ole’), or Hades in the NT, the world of the dead): for He shall receive (לָקַח laqach (law-kakh’), to take) me.” (Psalm 49:15). Genesis 5:24: And Enoch walked with God: and he was not; for God took (לָקַח laqach) him. God will take or receive us to Himself when we die. Psalm 73:23-25 Nevertheless I am continually with You: You have held me by my right hand. 24 You shall guide me with Your counsel, and afterward receive (לָקַח laqach) me to glory. 25 Whom have I in heaven but You? and there is none upon earth that I desire beside You. Here is faith that reaches beyond this life, and it hinges on the Hebrew verb (לָקַח laqach, to take). For the believer in Yahweh in Old Testament times, death did not end it all. There was life after death, and that life was to be in the presence of the living God. While Enoch did not experience ‘resurrection,’ he did experience glorification. He did, along with Elijah, transcend this mortal life and go in his body to be with God. Since Enoch had not died, he could not be resurrected. The following verse is a prophecy about the Christ, nevertheless it indicates a knowledge of the resurrection from death. Psalm 16:10 For You will not leave my soul in hell; neither will You suffer Your Holy One to see corruption. Man that is born of a woman is of few days, and full of trouble. 2 He comes forth like a flower, and is cut down: he flees also as a shadow, and continues not. 3 And do You open your eyes upon such a one, and bring me into judgment with You? 4 Who can bring a clean thing out of an unclean? not one. 5 Seeing his days are determined, the number of his months are with You, You have appointed his bounds that he cannot pass; 6 Turn from him, that he may rest, till he shall accomplish, as an hireling, his day. 7 For there is hope of a tree, if it be cut down, that it will sprout again, and that the tender branch thereof will not cease. 8 Though the root thereof wax old in the earth, and the stock thereof die in the ground; 9 Yet through the scent of water it will bud, and bring forth boughs like a plant. 10 But man dies, and wastes away: yea, man gives up the ghost, and where is he? 11 As the waters fail from the sea, and the flood decays and dries up: 12 So man lies down, and rises not: till the heavens be no more, they shall not awake, nor be raised out of their sleep. 13 O that You would hide me in the grave, that You would keep me secret, until your wrath be past, that You would appoint me a set time, and remember me! 14 If a man die, shall he live again? all the days of my appointed time will I wait, till my change come. 15 You shall call, and I will answer You: You will have a desire to the work of Your hands. This entry was posted in Biblical doctrines, Christianity and tagged afterlife, eternal life, everlasting life, Jesus Christ, John Hartnett, Old Testament, resurrection, Testament passages. Bookmark the permalink. 4 Responses to Did Old Testament believers have a concept of the afterlife? John, this is an excellent paper. I shared it on facebook. My son-in-law’s father argued that the Old Testament does not teach the resurrection, so I kept track of scriptures that undoubtedly teaches that. Martha affirmed that she believed in the resurrection just before Yeshua revived her brother. God bless you. Sean, Yes, we disagree on this one. But that is healthy, eh? You are trusting in extra-Biblical sources, aren’t you? Of course the dead are conscious of nothing. The dead ‘sleep awaiting’ resurrection. I use quotes because those words need redefinition in this sense. See comment below. The dead ‘live’ in the spirit. And I am not talking of ghosts, as I find no basis in scripture for them. But to die is to be with Christ. Besides the afterlife does not mean living as ghosts but it means resurrected in resurrection flesh in new bodies, as Job understood. And no man has ascended up to heaven, but he that came down from heaven, even the Son of man which is in heaven. is that no man has ascended who has come down from heaven, except one, and that is Christ. It was indeed Samuel who was summoned up from the grave. And God is saying through the Scriptures that Saul’s act was a sin against both Samuel and God. Although God forbids such practices He used the witch at Endor to bring up Samuel and rebuke Saul once more. See The witch at Endor was it Samuel or a lying spirit for a full analysis. Thank you for your responses, John. Yes, it’s healthy to debate, of course! 🙂 That link’s argument is pretty tenuous, in my opinion. Let’s keep the conversation going & God Bless you, brother…!